The DSS Counterintelligence (CI) Directorate seeks to identify and counter unlawful penetrators of cleared U.S. industry to stop foreign attempts to obtain illegal or unauthorized access to classified information and technology resident in the U.S. cleared industrial base. DSS CI articulates the foreign intelligence threat to U.S. government cleared industry leaders. DSS CI special agents are deployed across the country to support facility security officers (FSOs) and other cleared industry representatives in recognizing and appropriately reporting unlawful foreign attempts to acquire classified and controlled sensitive technology. 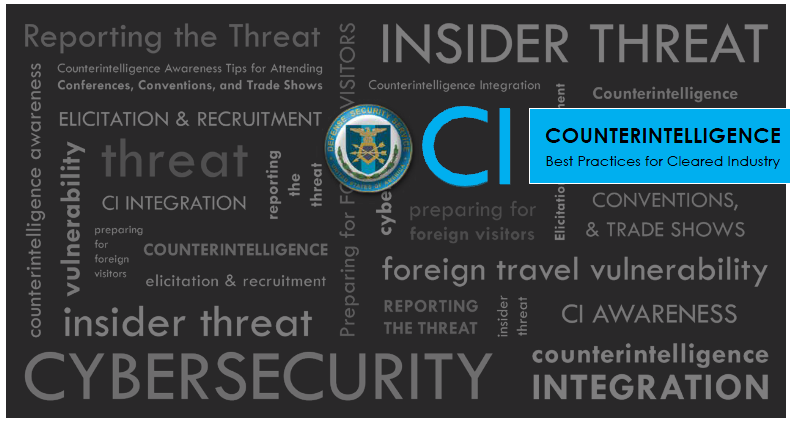 DSS CI’s risk-based approach incorporates a realistic assessment of threats to critical DoD research, technology, and classified information, and tailors CI services through objective criteria and threat categorization to mitigate the risk. United States cleared industry is a prime target of many foreign intelligence collectors and foreign government economic competitors. Cleared employees working on America’s most sensitive programs are of special interest to other nations. The number of reported collection attempts rises every year, indicating an increased risk for industry. While any geographic region can target sensitive or classified U.S. technology, DSS has consistently found that the majority of suspicious contacts reported by cleared industry originate from East Asia and the Pacific regions. Every region has active collectors. Cleared contractors should remain vigilant regardless of the collector’s assumed country of origin. The nature and extent of industry reported suspicious contacts suggest a concerted effort to exploit cleared contractors for economic and military advantage. These contacts range from outright attempts to steal technology to seemingly innocuous business ventures. Through analysis of industry reporting, DSS has found that foreign intelligence services utilize both commercial and government-affiliated entities. Recent industry reporting indicates that while foreign entities continue to use direct and overt means in their attempts to gain access to classified/sensitive information and technologies or to compromise cleared individuals, foreign entities are also returning to indirect collection methods. • Watering Hole attacks (compromised third-party websites) may provide a means for malicious actors to gain unauthorized access to your network or device.